Chiyogami is the Japanese name of the lustrous paper you see in the photos here. Here it is written in Japanese – 千代紙 . The character at the end 紙 means paper and pronounced ‘kami’ in Japanese. The Japanese paper more familiar to us is of course origami – 折り紙 . That tends to be a lot cheaper, but it was the pricier, gold-embellished variety that I took to. I first discovered it while living in Japan for 18 months and it features in much of my recent work. 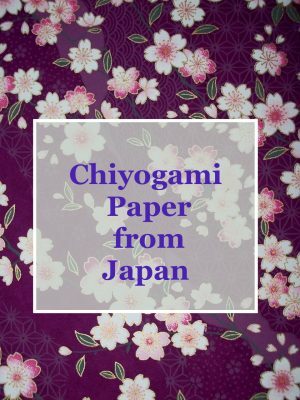 Chiyogami paper, also known as yuzen, was developed in the Edo period in Japan by skilled craftsmen. The vibrant patterns are silk-screened and if they remind you of kimono fabric that’s because that was the inspiration for the colourful surface designs. That’s why in traditional designs you’ll spot typically Japanese themes: cherry blossom and autumn leaves, for instance. The picture you see above was a pricier piece, but there are now cheaper alternatives. Real chiyogami feels like fabric – tear a small piece and you’ll see fibres. It’s easy to imagine it as a primary source of inspiration for fashion and interior designers. 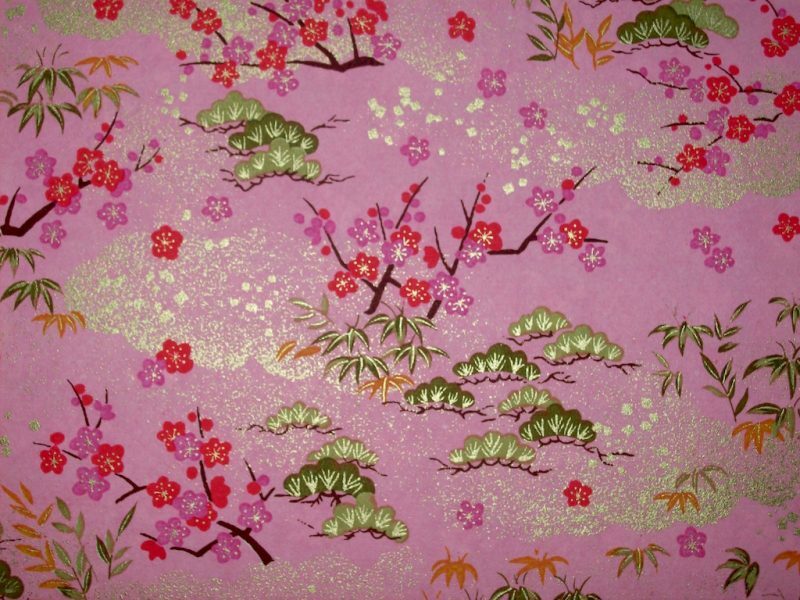 Can you picture a kimono made with the pattern below together with a red and gold obi (sash)? Yes please! HOW DO YOU USE CHIYOGAMI? In this stationery shop in Kokura, Japan (pictured below), upstairs is/was totally given over to racks of colour and gold (I say was because it may no longer be open). When I asked the gentleman working at the shop he explained that chiyogami finds its way into cards, place mats, lampshade and book covers. You may find a complete picture on a sheet measuring roughly 100 x 65cm, mountain or sea scenes, ready to frame. Even small pieces of furniture can get a chiyogami treatment. Shepherd Falkiners store in London have a stunning and ever-changing variety. Order online or even better, go into the shop itself if you’re in town. It’s fab and stocks even more than Japanese paper. They will deliver to you rolled and packaged in a protective cardboard tube. Washi in Denmark has a glowing selection of chiyogami and marbled papers, plus some of those gorgeous larger pieces which you can pop in a frame and brighten up a blank wall. The Rare Orchid boasts a vibrant website. I received a beautifully-packaged batch of sumptuous paper from their Californian base last summer and can’t wait to use it in my work. And they’ve just brought out a new range! Washi Arts (USA) has a great Instagram page and you can buy an impressive array of not only papers but tools and artist supplies too (check out the chiyogami pencils!). Mulberry Paper, an Aladdin’s cave of hues, just waiting for me to drop in with a large shopping bag. The Japanese Paper Place in Toronto, Canada is only for wholesale, but it’s worth a look for the informative website. Lastly try Japonerias which has lots of colourful bits and bobs, including chiyogami. The site is in Spanish. Edited to say: Also in English. I think it defaulted Spanish because I’m in the Canaries (a good excuse to pop overboard to Spain on my way back to Glasgow and stock up! 😉 ). CAN I BUY IT IN JAPAN? In Kamakura near Tokyo? You really should go and not just for the huge Buddha statues. 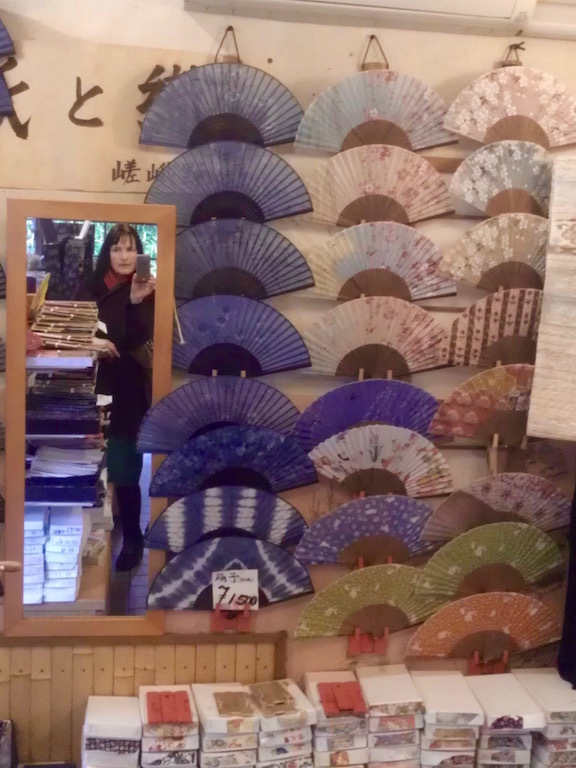 As luck would have it my camera batteries had died by the time I discovered Shato, a delightful store on Komachi-dori. Read this interesting article by Tomoko Kamishima who also does a beautiful blog called Japan Silhouette. In many big Japanese cities you’ll find branches of Tokyu Hands and Loft, my favourite department stores. Both sell small sheets of chiyogami. Better ask a Japanese friend to help you navigate the websites though! Lots of traditional arts and crafts at the Kyoto Handicraft Centre. The website says it sells goods created in yuzen paper, so here’s hoping they sell sheets of paper as well. Near Kyoto is Arashiyama. The direct translation is Storm Mountain, so for that reason alone it’s worth a visit! I discovered a little store on a wander through town with my friend Yuko, so I couldn’t . As well as sheets of beautifully embellished paper they had these lovely little fans on the wall (apologies for rather dull cellphone photo which doesn’t do the colours justice). I posted a bit about my work here the other day. I add random strips of chiyogami torn from larger sheets or cut out rings and circles to collage onto my brightly-coloured abstracts. It seems a bit of a sacrilege to rip this precious paper up and only buy it for this reason. Additionally, I cut out frames with my metal ruler and cutting board to edge cards and larger artworks. 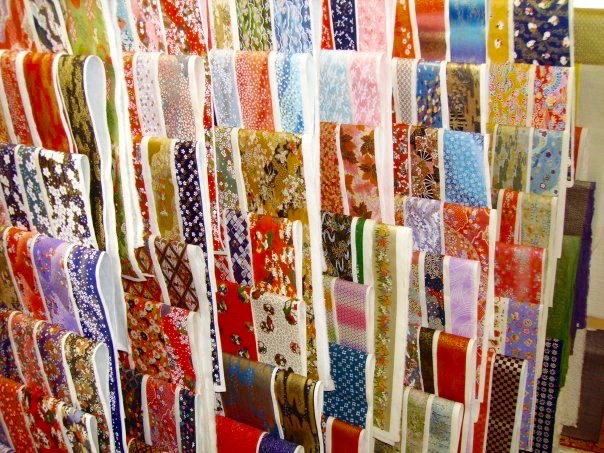 Do you know any other places to buy Japanese paper? Drop me a line in the comments below. "Chiyogami paper: In my art"
"Stephen Scott: Artist of the month"